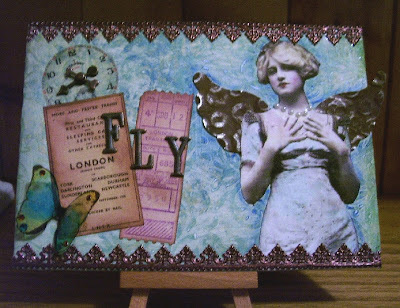 I finished something today and I said Oooo La La....my friend Kathy for her OWOH giveaway is an altered canvas. Well I put my name in for her draw and of course Kathy and I have known each other for a few years now and have even met in person a couple of times through a painting group we belong to on Yahoo and we keep in touch regularly.....ok that being said I have seen some of these canvases altered but never tried one so......since I am a painter as well I had some in my stash and thought why not try it.....oh my goodness, I think I am now addicted to another type of artsy thing. I have a few other ideas lined up and I might even make one for a third prize for my OWOH giveaway. I hope I can complete it tomorrow and add it to my post. Here is what I came up with.....I can't remember where I got this image but I just love it, I enlarged her to fit my 5x7 canvas. This canvas is not on a frame it is one of those flat canvas boards purchased at your dollar store. Yes I am thrifty. I did a paint/Cuttlebug technique on the paper (yes a tut coming soon to a blog nearest you, tee hee) I put some rusty metal wings through my CB then sanded them to distress them a bit. Added some tickets from an ArtChix collage sheet. I made these transparency butterflies I just learned how to make, I added a transparency clock again from ArtChix, added Tim Holtz watch hands, added some German scrap in a chocolate colour, ooo so pretty, then I added some pearls to my woman, gave her some make up and just added a bit more colour to her dress with chalk. I also did some inking of the edges on the tickets. The metal "Fly" letters are from the dollar store and the back of the canvas has been covered with the same paper only it is the original colour not muted like I did with my technique. These are so much fun and I just went for it. I don't even know if I will keep this or maybe stash it for a gifty. OOO thanks to Kath who put the idea in my head....I have a bird one coming soon and some Geisha girls serving tea. Stay tuned and thanks for dropping by. Beautiful!!! I am not a painter- but would love to learn...I will have to sign up for classes once I have the time.....! I love all of the accents you added- the metal wings in the Cuttlebug...love the butterfly, tickets, choc scrap...Awesome! This is really cool. The pearls were just the right touch. great canvas, and yes they are addicting! It's beautiful! Well done! I love doing canvases! This is exquisite! I can't believe you've never done one before. I'm looking forward to seeing more - so glad you're addicted! BEAUTIFUL! I can't believe that is your first ever canvas...it looks like you've been doing these forever. So pretty! HI Lesley. I left a comment at Bella Creations but wanted to say on your Blog how much I love this. Hard to imagine this is your first time. Looks great Lesley! I have recently become a fan of altered canvas myself. It is addicting!